What is the Sequence of Return RIsk? What does the sequence of return risk mean and what are its implications for soon-to-be retirees? The idea is that immediately after retirement (early retirement or regular), the inflation-adjusted real market returns in the first 10-15 years have a much greater say in determining your final portfolio value than the returns later on in your retirement. In other words, immediately after retirement, a long bear market (i.e. series of poor or negative returns) followed by a long bull market (i.e. series of great positive growth) will yield a portfolio that is significantly less than the opposite, i.e. a long bear market followed by a long bull market. This is true even when the average annual return is held steady across both scenarios. An important point to note is that the sequence of return risk only applies if you systematically withdraw fixed amounts from your retirement portfolio to cover your living expenses. If there are no withdrawals from your portfolio, the final value of your portfolio will be exactly the same in both scenarios since the average annual return is held steady. Mathematically, the value of a portfolio without any withdrawals is strictly determined by the average annual return over a period of time. So as long as you don't sell your investments during the bear phase, the bull phase that follows will bring the portfolio back to the level determined by the average annual return rate. The sequence of return risk should be taken very seriously. It has serious implications on the probability of success of your portfolio over the long run. If you run into a tough bear market for 10 years immediately following your retirement, but continue to blindly keep withdrawing 4% of your original portfolio amount year after year, you run the risk of exhausting your portfolio too early. Once your portfolio reaches $0, there are no more equities left in your portfolio to grow back up again when the bull market finally arrives 10 years later to make up for the initial poor returns. Imagine a retiree with $1,000,000 who needs to take a big $500,000 withdrawal at the end of the first year. With the “good” sequence, the portfolio grows 100% from $1,000,000 to $2,000,000, easily funds the $500,000 withdrawal, and after the 50% drop in year two finishes with $750,000. By contrast, with the “bad” sequence, the portfolio falls 50% to $500,000, the $500,000 withdrawal completely depletes the portfolio down to $0, and the subsequent 100% return is now irrelevant because you can’t compound an account balance of zero! In practice though, the probability of a long bear market right after retirement depleting an early retiree's portfolio down to a level so low that the 4% rule doesn't hold anymore is rare. The more common case is when a retiree is trying to figure out what their portfolio value is going to be at the end of the 10 or 15 year period. Perhaps a regular retiree in their 60s would like to leave a sizable sum to their spouse or children in the way of an inheritance. Perhaps an early retiree is trying to optimize for a larger net worth 10 years down the road so he or she can reduce their annual withdrawal rate from the recommended 4% to something as low as 3%, thereby reducing their probability of running out of money to virtually 0. The average annual return is 7% yielding a final portfolio value at the end of year 10 of $1.97 million, roughly a 197% return over 10 years. The Rule of 72 states that your money doubles every 10.3 years at an interest rate of 7%. However, since the average annual return is held steady at ~7%, the final portfolio value also stays the same at around $1.97 million. Thus, when there are no withdrawals from the portfolio, the sequence of return is irrelevant as long as the final average annual return is kept the same. In this case, the average annual return over the 10 year period is the only factor that determines the total return, which in turn determines the final portfolio value. The order, direction, and magnitude of the returns year after year during those 10 years are consequently irrelevant. When does the sequence of returns matter then? It's when you start to feed off your portfolio and take annual withdrawals to pay for your ongoing expenses. When regular withdrawals kick in, the sequence of returns starts to matter dramatically. Let's start with the same $1 million dollars and look at the ending portfolio value after 10 years across 4 new scenarios, but this time withdrawing 4% of the initial portfolio value each year. That's 4% of a million, i.e. $40k a year withdrawn for normal living expenses incurred in retirement (rent, food, travel, gas, heat, internet, etc.). We'll look at 4 scenarios. For all 4 scenarios, we will maintain the same average annual rate of return at 7% to keep the comparisons fair. The 4 cases above all start with the same portfolio amount, have the same withdrawal amount ($40k), maintain the same average annual return over the 10-year period, but show different sequences of returns. They all add up to the same total and average returns, but the final portfolio values (in bold) are massively different. How can this be? Let's take a closer look. In the first scenario (Scenario A, Bumpy Start), we're off to a rocky start with 3 consecutive negative returns the first 3 years into retirement. We then have 2 bumper years following the short bear spree. In this scenario, our $1 million initial investment ends up at $1.2 million after 10 years, while consistently allowing us to withdraw $40k at the end of each year. The next scenario (Scenario B, Pessimistic Start), we start off with disastrous returns the first 2 years immediately into retirement. Our $1 million portfolio is reduced to a mere $356k. We've lost a whopping 65% of our portfolio! 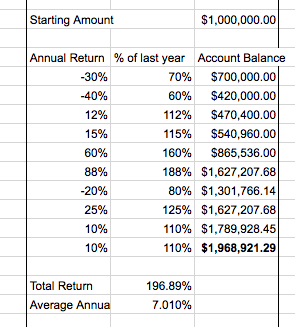 Even though the 12% return is pretty good the following year, our portfolio only grows by $3k to a mere $359k. This is due to 2 factors. First, we have a fixed $40k withdrawal which is now a larger percentage of our already depleted portfolio. Second, a 12% return on a smaller portfolio is still a smaller amount of growth in absolute terms. At the end of the 10th year, we end up with a mere $24k higher than our original portfolio amount of $1 million. In other words, we have seen virtually no growth in our portfolio over the 10 years, even though we've averaged a 7% average return over the same period, keeping in mind that we've taken out $400k for expenses. Scenario C is the Optimistic Scenario where the first 6 years following retirement is the best bull market you've ever seen. Retiring right at the start of a bull market couldn't have worked out better for our hypothetical early retiree in Scenario C. Despite pulling a cool $40k a year for ongoing living expenses, we end up with a solid $1.6 million in our portfolio at the end of the 10-year period. This is also despite the crazy -40% return in Year 9 which was needed to bring the average rate of return back down to 7%. Scenario 4 illustrates a predictable and balanced fixed return of 7% year over year. This is clearly hypothetical since the equities market tends to be a lot more volatile than this. But for the sake of argument, let's say your portfolio was invested in some type of international bond fund that spits out 7% year-over-year consistently, with all proceeds reinvested after taking what you need for expenses. In this scenario, we end up with a final portfolio value somewhere in between Scenario A (Bumpy Start) and Scenario C (Optimistic Start) — a modest $1.4 million. So clearly, even though the average return across all 4 scenarios is kept fixed at 7%, the final portfolio values vary dramatically, on the order of hundreds of thousands of dollars. This is achieved by simply adjusting the sequence (i.e. the order) in which the returns are realized. Put the negative returns in the beginning and you end up with virtually no growth, but move those same bad returns to the end and your portfolio is a lot bigger now! The average percentage of the portfolio withdrawn in all 4 scenarios are: 4.5%, 6.3%, 2.3%, and 3.2% respectively. As you can guess, even though we're steadily withdrawing 4% of the initial value of the portfolio in all four cases, the percentage of the portfolio that ends up getting withdrawn at the end of each year dramatically changes based on how the markets performed that year. In the bear years, the withdrawal rate shoots up, but in the bull years, the same withdrawal percentage goes down. The average withdrawal rate in Scenario B (Pessimistic Start) is as high as 6.3% even though we set out to withdraw only 4% every year! In the Optimistic Start (Scenario C), we only withdrew 2.25% on average across all 10 years even though we set out to withdraw 4% every year — thanks to the stellar returns seen in the first 6 years. Now that we know about the sequence of return risk, and what it can do to our hard-earned nest eggs, how do we combat it? Certainly if you knew ahead of time whether the current year was going to be a bull or a bear market, you could re-constitute your portfolio to sell equities (and replace with bonds) in a bear market, or buy more equities (selling bonds) to take advantage of the upcoming bull market. But no one knows what the year is going to look like ahead of time. It's even harder to predict whether the next 3 to 5 to 10 years will be largely bullish or bearish. However, as we've seen above, the biggest predictor of your final portfolio value (not including the average return of the market which is out of your control) is your annual withdrawal rate over the years. Even if you start off by planning to withdraw 4% of your original portfolio value, when the market plummets, you may find yourself withdrawing anywhere between 5-10% during the tough bear years. Not many things in life are under your control, but your withdrawal rate certainly is. Some of the $40k you withdraw every year may need to go to necessities such as food, rent, gas, or your car. But the rest of the money may be going to luxuries such as vacations, fancy organic groceries, gourmet coffee, or other discretionary spending such as gifts, tips, etc. If you can therefore cut down on your non-mandatory discretionary expenses during the down years, you can keep your withdrawal rate as close to 4% as possible (inflation adjusted). Even better if you can move to a lower cost of living city or country during the years the market is down. If you have the flexibility to move to a rural area or a cheaper country in Asia for example, you can dramatically reduce your withdrawal rate. You can then return back to your home town when the market starts to recover from the bear market and enters a healthy bull market. If you can manage to keep each years' withdrawal rate to below 5% by adjusting your lifestyle and luxury-levels dynamically based on the market returns, you hard-earned portfolio will have the highest chance of not just surviving, but also thriving exceptionally once the market goes back into a bullish boom. Supplementing your income by engaging in side gigs or part-time work is also a terrific idea. Earning just $20k/yr (or $9.6/hr) is already 50% of the money required to furnish a basic $40k/yr retirement. At the end of the day, the name of the game is flexibility. When people say that the long-term return of the market is 7-8%, they mean that over several decades. In the short-term however (say, a few years), the returns could swing drastically between -40% to 40%. The only way to counter this volatility is to be flexible with your own spending. Retirees who are therefore more flexible with their retirement setup stand to gain handsomely by dialing down their annual expenditure during the bear years and going back to leading a normal retirement during the bull years. The highly flexible retiree will thus enjoy the benefit of passing on a larger nest egg to their surviving spouse and kids after they themselves pass away.